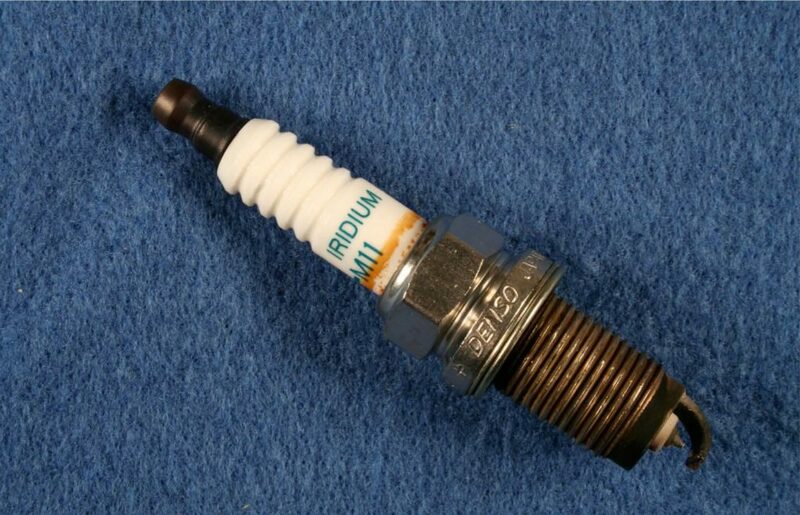 Outwardly the appearance of a spark plug has not changed. But internally there have been many improvements. Although a current spark plug looks very similar to a spark plug from 50 years ago, changes have occurred in the materials and construction. These changes have increased the useful life of the plug minimizing the number of “tune ups” a vehicle might need. The changes though have also increased the price of the product. One change that might lead the consumer to believe that the product is much more expensive is the fact that refractory metals are used in the current products. But does the amount of the costly precious metals really account for the increase in price? Construction of spark plugs has changed over the past 50 years with an accompanying rise in price. Improvements include new alloys used for the electrodes, more efficient insulators and better thermal conductivity of the center electrode. Electrical improvements have reduced noise in a vehicle’s electrical system. Exotic materials and unusual aircraft engines have made their way into the automobile market. Up until the late 1970’s gasoline was leaded and spark plugs were inexpensive disposables. They ran at a lower temperature and were easily fouled with uncombusted and partially combusted material. If they ran hotter to minimize the amount of partially combusted materials, they had a different problem; corrosion by fuel additives needed to minimize lead deposits on more expensive engine components. When unleaded gasoline was mandated for all vehicles, the life of a spark plug should have increased. But this mandate coincided with standards aimed at improving fuel efficiency and minimizing emissions. Engines were designed to run with a leaner fuel mixture leading to increased electrical erosion in the spark plugs. To minimize the erosion the automobile spark plug manufacturers took a strategy used in the aircraft industry. Put a refractory metal tip on to the electrodes. These designs are more durable and reliable. But is this amount of expensive metal the sole cause of a five-fold increase in the price of a spark plug? We examined two used spark plugs. One was from a 2007 model year SUV and the other from a circa 1980 motorcycle engine. Although unleaded gasoline is used in the motorcycle, the spark plug design is close to that of the pre-unleaded gasoline spark plugs. 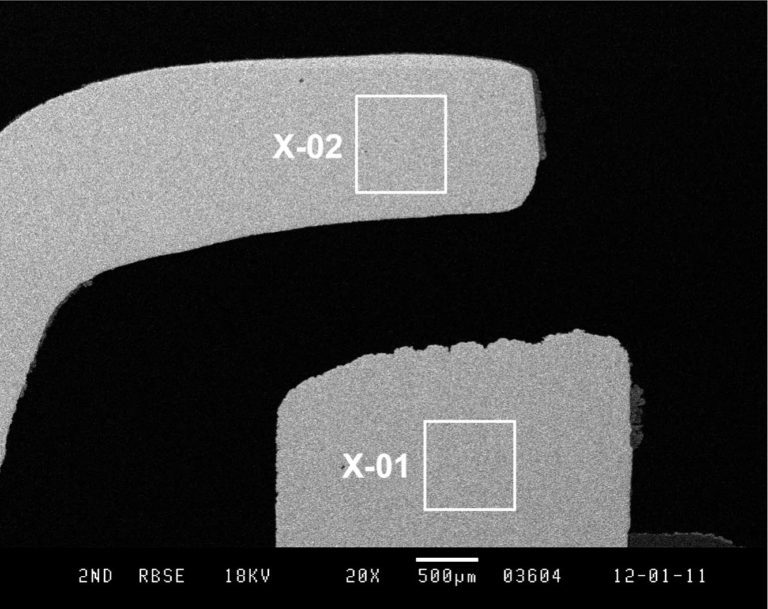 The two samples were cross-sectioned and polished, and the construction differences are immediately apparent when imaged in the Scanning Electron Microscope (SEM) at low magnification. The first plug is the older design. 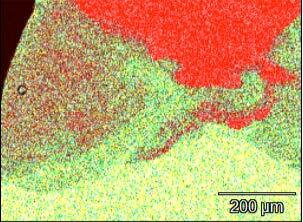 In this micrograph we see that there are two areas marked as X-01 and X- 02. These are the areas examined at higher magnification and analyzed by Energy Dispersive X-ray Spectroscopy (EDS). The more recent plug is shown in the second image and it is obvious that the structures are very different. Here we can see the refractory metal tip. In this micrograph the areas marked X-03 and X-04 was examined by EDS. Looking at the conventional plug first, the EDS of area X-01 shows us that the tip is composed almost entirely of nickel. The EDS of the comparable area in the newer plug (X-04) tells a different story. 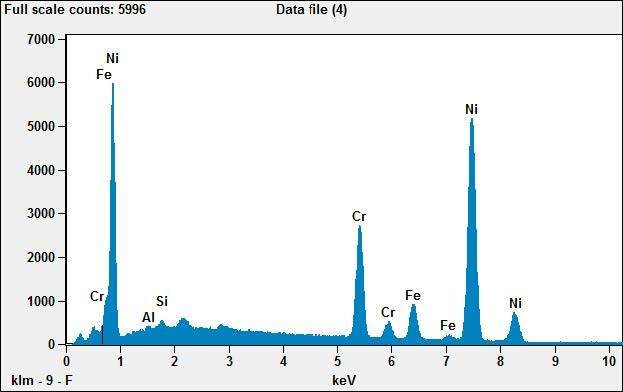 Here we see a composition that is nickel and chromium with smaller amounts of other metals. But the plug is marked Iridium. So where is that? 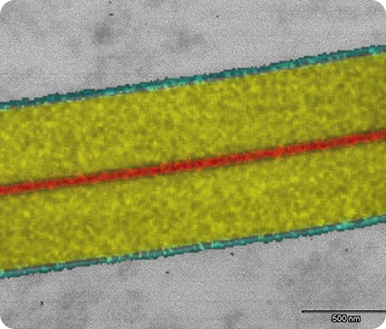 We noticed in the first micrograph that the tip of the newer plug “glowed”. This effect is the result of imaging in Backscattered Electron Imaging mode, where higher atomic number materials appear ‘brighter’ than lower atomic number materials, and that is the area examined next. 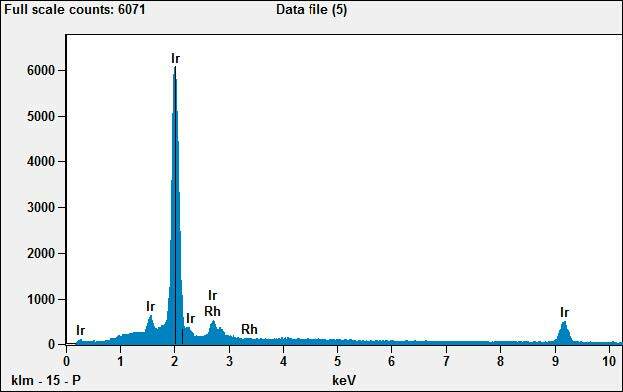 The EDS spectrum from area X-05 shows 90% iridium and 10% rhodium. Here is the precious metal content labeled on the plug. But why is it mixed? Pure iridium is very hard and brittle. Rhodium is softer, and a mix of the two would result in a material that is easier to draw into a wire. We notice something else in this picture though. The iridium looks like it was “stuck” into the metal collar that we identified before as predominantly nickel. 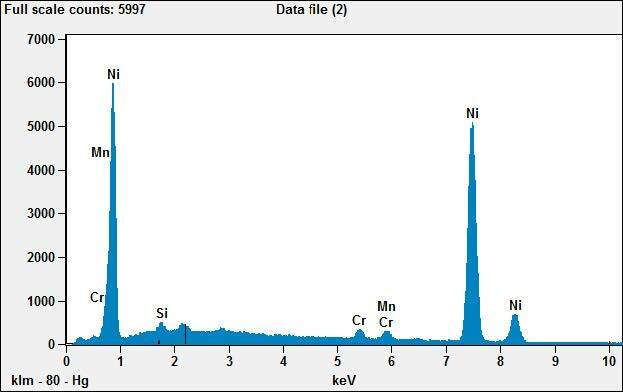 An X-ray map showing the distribution of the nickel and iridum illustrates this quite clearly. The light green in the map represents nickel and the red, iridium. The red and green are intermixed on the left of the map and the nickel and iridium appears to have partially mixed. This map is consistent with the iridium wire being fusion welded into the tip of the electrode. A quick look at the local auto supply store shows that the spark plug for the 1980 engine sells for $1.69 each while the one for the 2007 engine is $7.19. Is this all due to the amount of precious metal in the plug? Aparently not. 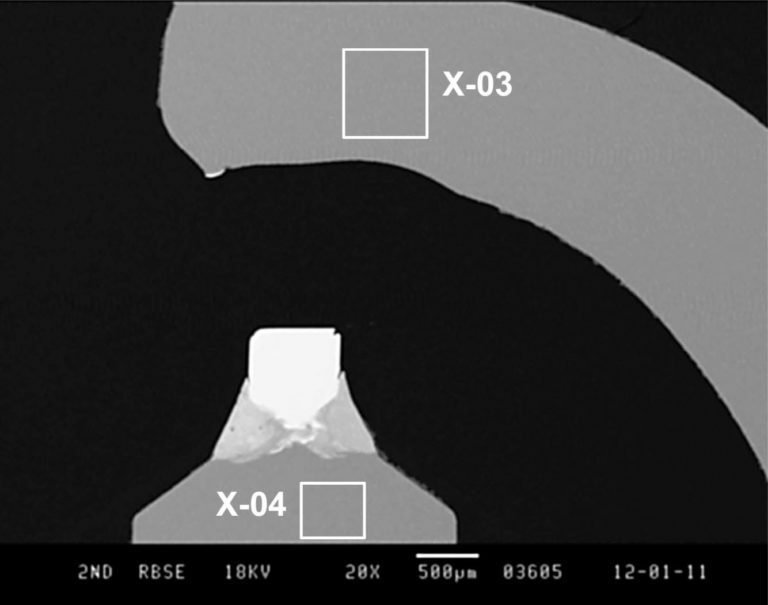 From the micrographs we can estimate the size of the iridium wire as a cylinder about 0.8 mm long by 0.7 mm in diameter, which would have a volume of 0.352 mm2. Accounting for the density of both iridium and rhodium this would represent about 7.5 mg of precious metals. At today’s market price, that amounts to about 25¢ worth of precious metal. 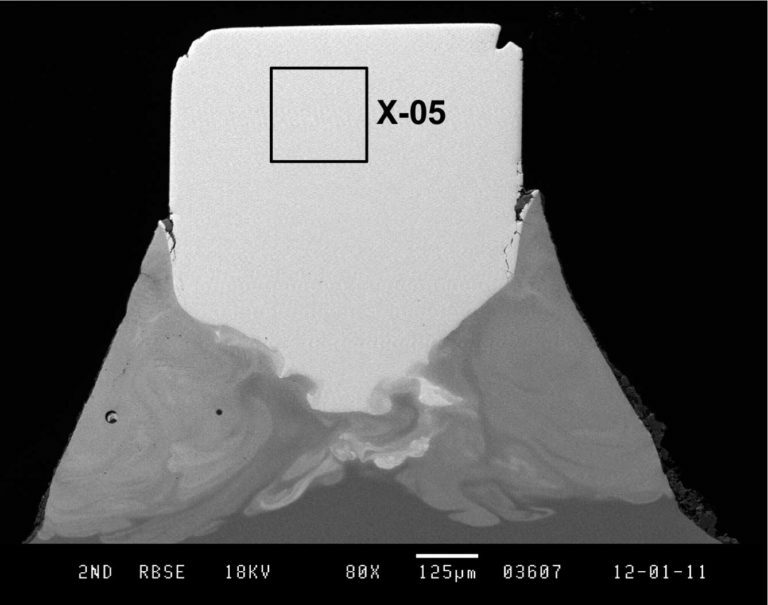 Scanning Electron Microscopy and Energy Dispersive Spectroscopy are tools that are used to elucidate material problems. But with the ability to map the distribution of a material and to measure dimension of a sample, much more information can be extracted from a simple analysis as illustrated in this example.